After two great days in Luodong, we had a decision to make. 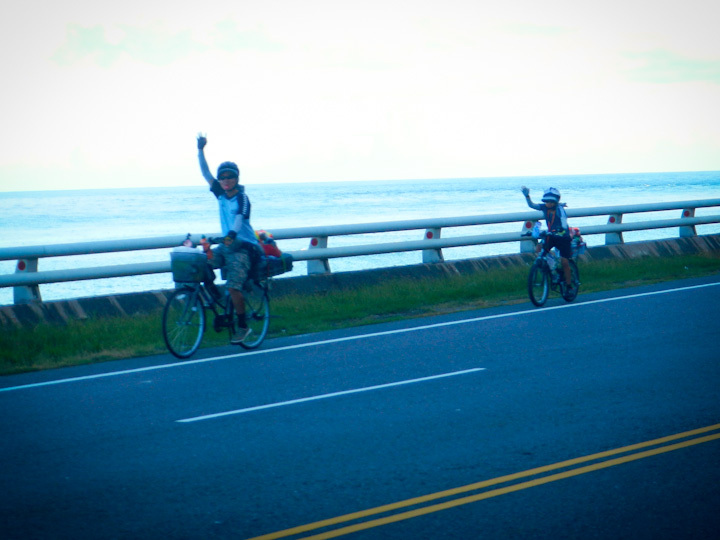 The Suao highway is the only road that connects Yilan and Hualien, and pretty much every cyclist we talked to described it as dangerous. It is narrow, frequently travelled, and skirts the edges of large cliffs along much of its length. Funnily enough, many cyclists we talked to had ridden it, but do not recommend it to others. Once we learned that it also involves long tunnels that are specifically marked ‘no bicycles’ we decided to take the train to Hualien instead. There are plenty of other long tunnels to cycle through on the East coast, none of which were prohibited for cyclists, and most of which were pretty unpleasant. I can’t imagine what the ones that ban cyclists would be like! On top of that, the train in Taiwan is extremely bike friendly, especially on the East coast. There are specific trains that are designated ‘bike friendly’ (basically all those not at rush hour), and you simply pay half an adult fare to bring your bicycle with you. There is even a special car designed for bicycles and cyclists that runs on the No. 274 & No. 275 trains, if you can work it into your schedule! We simply rode up to the station, and told the man at the counter we had two bicycles with us. We were on a train and heading south within 15 minutes of arriving at the station! With our decision to take the train to Luodong, our rest time increased considerably. Hualien is an amazing area – home to the stunning Taroko Gorge. We rented some scooters and explored the area for a few days, including driving to Wuling, a lofty 3275 m above sea level. That’s so high up that there’s not enough oxygen for the scooters to have proper combustion, and walking to the elevation marker made me feel light headed! 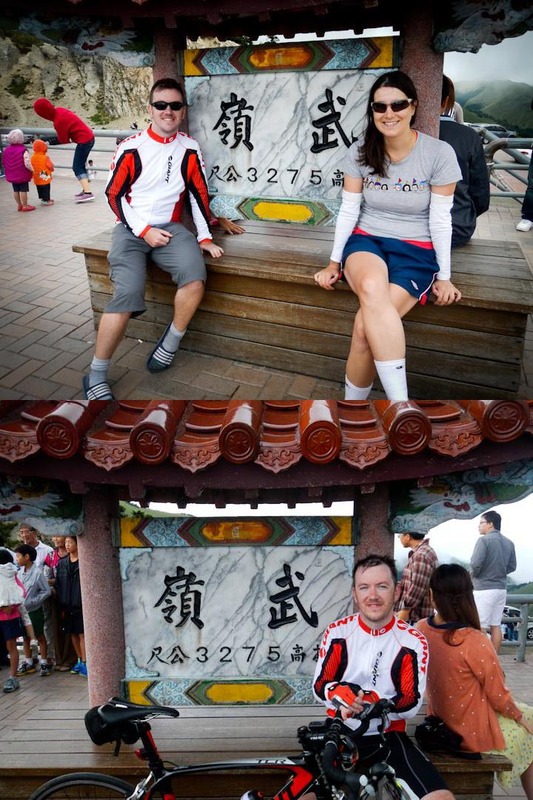 Even more amazing than that is the fact that Mike cycled to the summit the next day! It is a great challenge in Taiwan, and we saw many people attempt it. 3275 m above sea level at Wuling! First we scootered (top), then Mike biked (bottom). The day after Mike conquered Wuling, it was time to move on. We took no more rest days for the remainder of the trip. The next major city after Hualien is Taitung (Taidong), but being nearly 180 km away, we stopped just shy of half way. We asked a foreigner living in Hualien about the trip (Is it hilly? Where should we stay? ), and he recommended we stay in a little minsu (B&B) just south of the Tropic of Cancer. It was quite a nice place, just outside Jingpu Village. The lady running the place was amazed we arrived on bicycles and made us a supper of delicious dumplings, soup and fresh fruits. Yum! He was certainly spot on about that. He was a bit off with the hills though. It wasn’t, as he suggested, ‘pretty flat’. There are some long stretches of tunnels that, while unpleasantly narrow and loud, cut out quite a bit of climbing, but there was a category 2 climb tossed in there for good measure! Most of the way was gentle rolling hills that provided excellent views of an unbelievably scenic coastline. That combined with a wide and smoothly paved bike lane made for excellent riding. 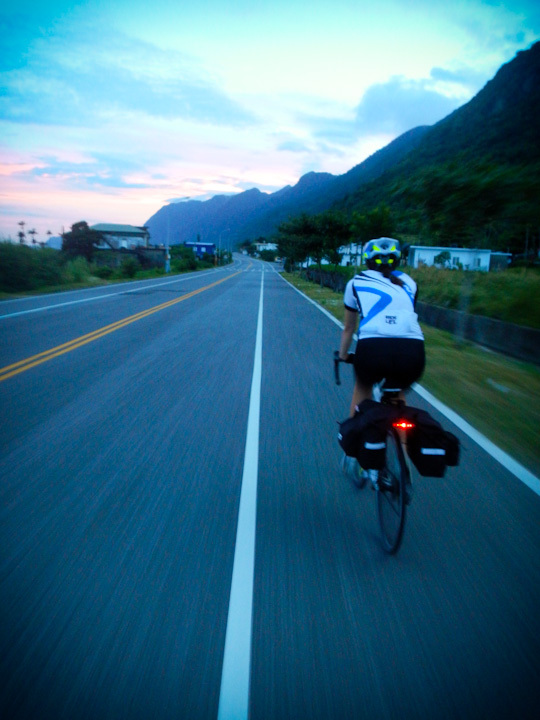 The great cycling conditions continued the next day on to Taitung, and we stopped to watch an amazing sunset into the mountain range in the centre of Taiwan before heading into the heart of that city. It was a long day, as it was extremely hot, and we basically hopped from one 7-11 to another, cooling down with air conditioning and slurpees before applying more sunblock and trying to get to the next one as quickly as we could. I can’t comment much on Taitung, as we arrived late and left early, but we were treated to some fireworks as part of Ghost Month. 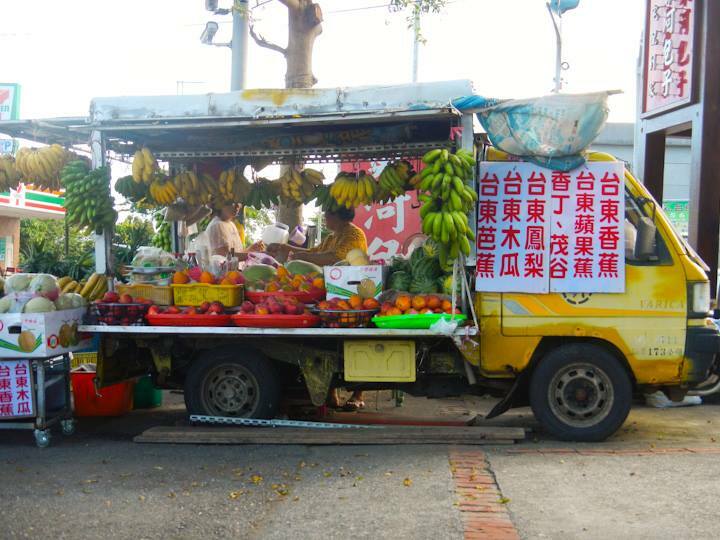 Fruit trucks are a welcome sight on a hot day. The final two days of our East coast adventure were interesting ones. The next major cities after Taitung are Kenting and Kaohsiung, both on the other side of the central mountain range in Taiwan. The mountains get smaller as you move to the coast, but you must cross them regardless, and the 130 km between the Kenting area from Taitung includes a climb that is often mentioned when you ask about cycling huandao. With the knowledge of a big climb, we decided to split that section in half, and cycled to the tiny town of Dawu. I called ahead and booked us a room in a little minsu (all in Chinese! ), and the owner knew who we were immediately when we pulled into town. Her minsu was very cheap, and very comfortable. We had an amazing seafood dinner, and met another pair of cyclists who were headed off to Kaohsiung the next day. 加油! Jai you! Way to go! We woke up to rain, which was heavy at first, but became lighter in the early afternoon. We didn’t mind, as it kept everything cool for once. 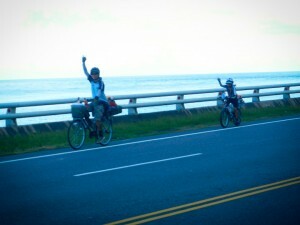 After hiding out under some awnings and in a Family Mart, we tackled the climb over to the West side of Taiwan. Cycling the Northern Cross must have made me stronger, because I didn’t have trouble on this one at all! Riding huandao clockwise is certainly a good decision from the point of view of this crossing – the road on the East side of the moutain is all switchbacks and there are not too many places with steep grade. However, if you ride counter-clockwise (like many riders), the hill begins with a steeply graded section that would be quite a challenge. For us, though, that section was a ripping downhill right into town. It was a treat to be up in the mountains one last time, and this time, in an area with many aboriginal settlements. Their architecture is a little bit different than much of what we had been seeing, and there was a lot of parkland too. All in all, cycling on the East coast was some of the best cycling I’ve ever done in my life. As I mentioned before, the bike lanes are wide and well paved, the views are spectacular, and everyone loves to say hello and shout 加油 (jai you, go go!) and ask you questions about where you’re from. I would holiday there with my bike again in a heartbeat.